The National Alliance of People's Movements (NAPM), India's premier apex body of several mass organizations, has called for an urgent coordination between India's different people's movements and political parties in order to fight against what it called “increasing attacks on freedom of expression” by the Narendra Modi government. 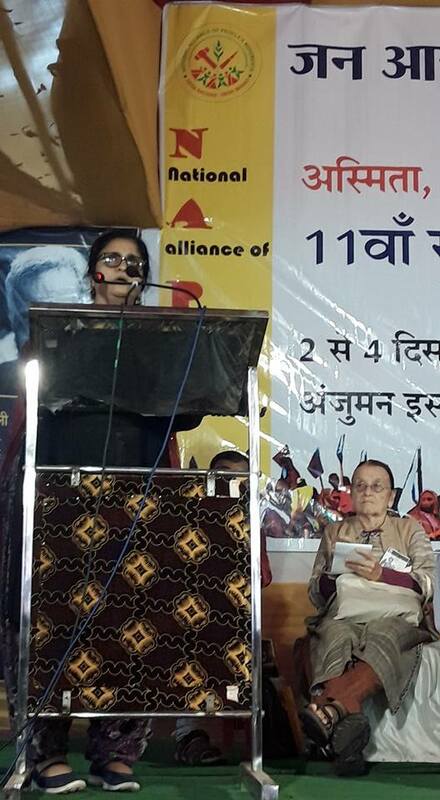 The three-day NAPM annual meet at Patna's Anjuman Islamia Hall, which began on December 2 with its main leader Medha Patkar saying that political parties were becoming increasingly “opportunistic, exclusive and anti-poor”, ended on December 4 seeking political support in the presence of several non-BJP leaders. Among politicians who shared the NAPM meet included Jharkhand's ex-BJP chief minister Babulal Marandi; Janata Dal (United) spokesperson KC Tyagi, known to be close to Bihar chief minister Nitish Kumar; representatives of Left parties of different shades, including the CPI, CPI-M, CPI-ML; and from representatives from different mass organizations. No Congress leader was present at the meet. It is not known if any of them were called. More than 1,000 representatives from 200 organizations from across 20 states participated in the meet, whose main theme was Save Natural Resources, Constitutional values, and Principles of Equality and Justice. Patkar asked the gathering to gear up not just to “fight the battles” for lands, forests, and rivers, but also be prepared for “larger ongoing struggles the world over”, citing how unity of different forces has helped score some successes in land rights in Chattisgarh, Jharkhand, Odisha and the Narmada valley in Madhya Pradesh. Tyagi stressed on the need to “open a dialogue between democratic political parties and people's movements”, even as pointing towards how efforts were being made to “create an atmosphere of discord by spreading communal hatred”. 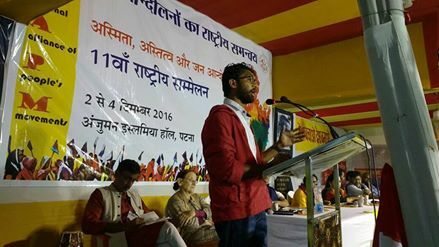 CPI-ML general secretary Dipankar Bhattacharya said, efforts were being made to bring an end to “all types of freedom”, seeking “a common programme on which political parties and people's movements”. CPI's Shameem Faizi and CPI-M's Avdhesh Kumar said there was a need to save the Constitution, which is under stress. The NAPM ended with the formation of a new coordination committee, with Patkar as the veteran adviser. Those in the team included Bihar's Ashish Rajan, Dorothy Fernandes, and Mahendra Yadav; Kerala's SV Venugupal and Vijay Raghav; Delhi's Nanu Prasad and Faisal Khan; Jharkhand's Jamyanti Barla; Odisha's Lingraj Azad; Bengal's Amitabh Mitra; Gujarat's Krishna Kant; Maharashtra's Suhas Kohelkar; Rajasthan's Kailash Meena; and UP's Richa Singh, Vimal Bhai, Dr Sunilam, Madhuresh and Meera. Special invitees included Kavita Shrivastav, Arudhati Dharu, and Kala Das.